That's probably enough to be getting on with, given this is going to have to be quite a catch-up. First, Sanguine Hum, seeing as they were the topic of the last thing I wrote, and the thing before that. To recap with an extremely compact history, I joined them in Feb 2012, we went to RoSfest in May 2012 to open the third day of the festival, and came back with a nice load of audio and video. First we made the audio into a live download album, and used the proceeds to pay for studio time in October 2012 to record our The Weight Of The World album. A couple of years later we brought out the Live In America DVD, and used the money from that to pay for studio time in June 2014 to record the Now We Have Light double-album, released in February this year. The NWHL double album had been exhausting, but somehow we recovered quickly and launched into the follow-up, Now We Have Power. We're doing a lot more work up front for this record before we get to the studio than we have in the past. We realised that, with the exception of the drums, so many of the final parts for the last album were recorded after the studio session, that we might as well aim to work that way. Except that instead of recording them afterwards, we can get them down beforehand, and just use the studio for final drums and things that need to go through loud amplifiers. So, I've been recording some demo drum parts, and it's been a welcome luxury to be able to evolve eight or nine takes over several days, rather than having to nail everything in the space of a couple of hours. I'm on the fifth song right now, which explains Make practice loop for Sanguine Hum new album demo #5. One down, three to go. 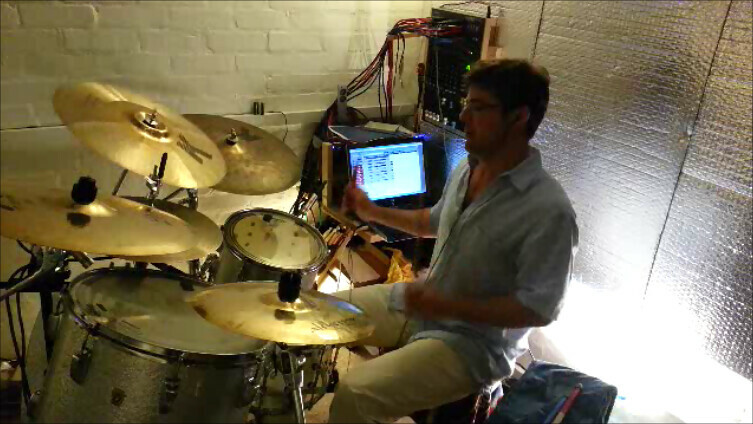 Oh, by the way, that picture there is me recording in my drum practice room. I've had my own drum practice room in South Woodford now since January 2013. You didn't know that. If you look closely you'll see that support for all three of these gigs will be Darkroom, otherwise known as Improvizone mainstays Michael Bearpark and Os. In the absence of any Improvizone activity, Os and Mike have been doing loads of Darkroom gigs by themselves, often at the Tuesdays Post evenings they co-organise, and have beaten the Sanguine Hum gig many times over. While asking them to support us will only make that worse, musically they are an excellent compliment and counterpoint to the complex Hum progisms. I have been doing most of the organisation for these gigs, hence item two of the four, Finish news release for Sanguine Hum Leicester gig, all part of a vital process of raising awareness of these rare gigs, in this case amongst the unsuspecting folk of Leicester. So I have more to do besides work through the NWHP demos and generally elevate my drumming skills to the point of actually being able to play in the band. It is fair to say that Sanguine Hum membership has tended to lure me away from any Improvizone organisation. The Sanguoids are not the only reason for the relative quiet hereabouts. The other is that Burning Shed impresario and genre-straddling crooner Tim Bowness, who, for a fourth summer in a row, is up to something involving a full live band. That band regularly includes Michael Bearpark and me. Again, in another very compact history to make up for zero bloggery on anything I've been up to in the last three years, the last I reported was the No-Man 2011 recording sessions in Steve Bingham's house, where I set up the drums in a room shared with two pet snakes. One of the three items from that session, a song called Beaten By Love, made it onto Tim's second solo album, Abandoned Dancehall Dreams. Tim was so encouraged by how well it was received when it came out in July 2014, a decade after its predecessor, that he set about making an excellent follow up, Stupid Things That Mean The World, released last month. To coincide with this release, Tim will be playing a handful of gigs. I always enjoy gigs with Tim. His music can require a deceptively large amount of preparation, of the kind that pays off in a satisfying way. In his own gigs he tends to headline, which means I get to bring any wacky drum kit configuration I like. He has a good fanbase and a regular audience. He's also not without a sense of humour. In one No-Man show three years ago, he was introducing the band members, and got round to me. And on drums, a man so posh he eats swan for breakfast. Lucky I wasn't pausing for a sip of water at that point, because it would have come straight out of my nose. I'm still chuckling at it now. We're going a step further in the preparation for these gigs that sitting in a rehearsal room for a week. We're going to attempt to demo the new songs in the set in the way that we will play them live. This will be necessarily different from the way we might have laid down multiple parts for the album. My part in this is Finalise the drums for four new Tim Bowness Live Band songs. Three down, one remaing. Finally, I have even more to look forward to this time, because for his UK gigs the support act is... Improvizone! Namely, to quote from Tim's publicity, Andrew Booker's acclaimed East London-based Ambient-Improv collective. It lives again!! I'll have an acoustic kit on stage for the main act, but for at least the London gig I intend to resurrect the electronic drums. This explains devise Midifier programming for Improvizone supporting Tim Bowness Live Band gigs, in reference to the remote-controlling of effects through which I will be passing various ordinary electronic drum sounds.